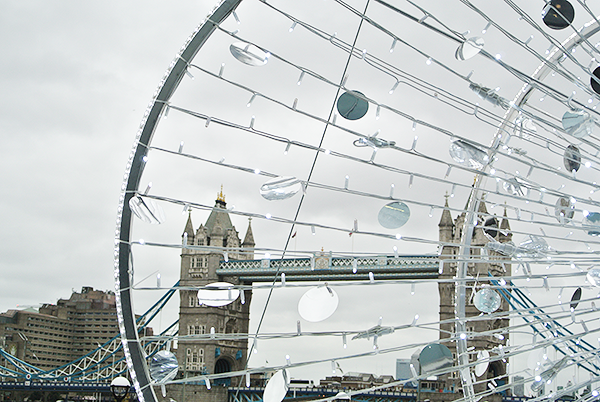 When I hit the South Bank for all the Christmas markets this year I started at London Bridge station and finished at the bottom of the London Eye. 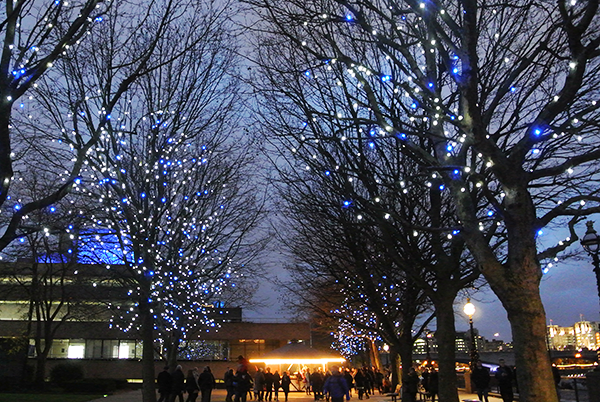 This nearly straight walk along the Thames usually takes 30-40 minutes (depending on your walking speed), but as you will be distracted along the way by festive lights and many, many, many food stalls, I recommend planning a full afternoon from lunch to dinner time for this outing. And don't eat anything before you leave the house, as you'll want to sample all the delights along the way! 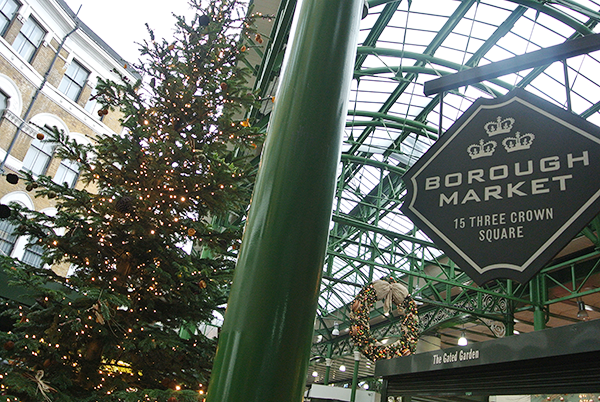 Getting off at London Bridge station (tube or train, both are just a stone's throw away from one another) I advise a short detour to the famous Borough Market for some sweet snacks or lunch first. The market is covered and so great to hide out in when a rain storm or heavy gusts of wind are making an appearance, and you can sample a lot of delicious delicatessen along the way; from cheeses and meats to bread and sweets, there will be something for everyone. 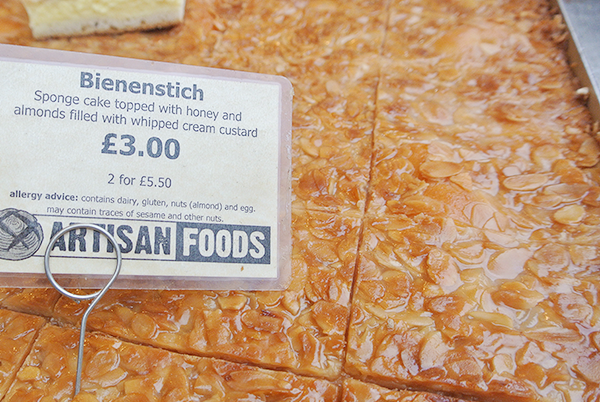 I can particularly recommend a cake stand near the entrance, which sells heavenly slices of bienenstich, a fluffy German sponge cake filled with cream custard and topped with a crunchy layer of almonds and honey. 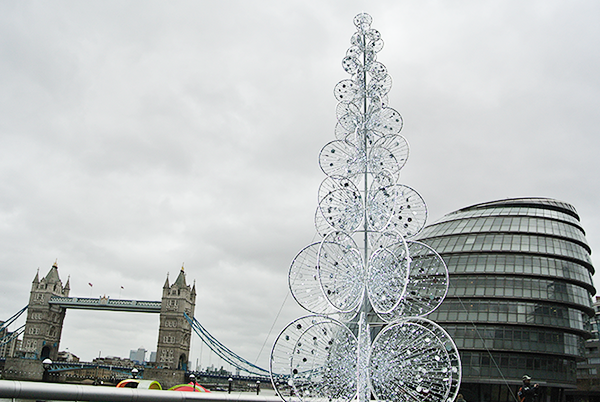 From Borough Market walk a few minutes down to the Scoop at City Hall, which is in the direction of Tower Bridge and where the London Bridge City Christmas Market starts (on until 3 January 2016). 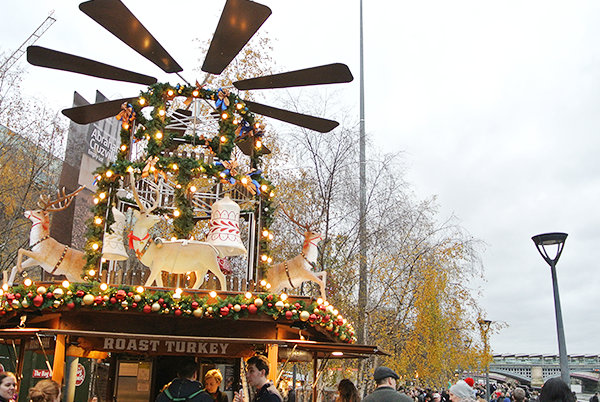 The little chalet-style stalls are scattered on the route across the Thames with the largest congregation at the Scoop itself and around Hays Galleria. 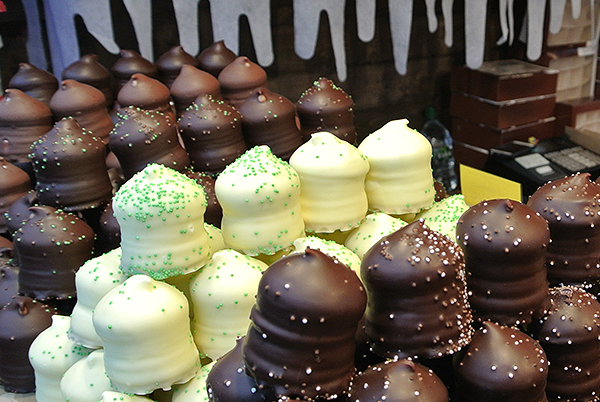 Particular highlights of this Christmas Market were the funky modern art Christmas tree at the Scoop and the beautiful decorations as well as a 'Chocolate kisses' stall at Hays Galleria. Most of the stalls here were food and while the atmosphere was lovely, especially as it got darker, I did miss seeing more independent shops selling their wares. 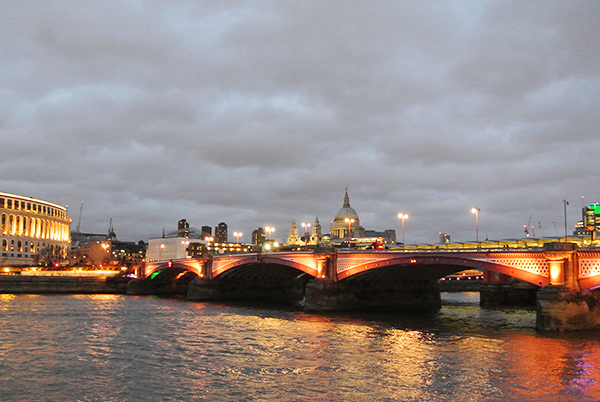 Walking along the Thames to the Christmas Market at Tate Modern (which is on until 23 December 2015), London really shows off its best side as it gets darker (around 4pm at the moment) and you can admire not only the festive decorations along the way but also iconic buildings along the river being lit up. The Tate Modern itself really went all out this year with a gorgeous Christmas tree and a lot of lights decorating the space outside the museum for the market stalls. The museum is free to enter (and so are most of its exhibitions) so if you need a break from the walking or the weather, this is the perfect spot to do this. You can also use the toilets, which is something that is always good to know when spending the majority of the day outdoors. 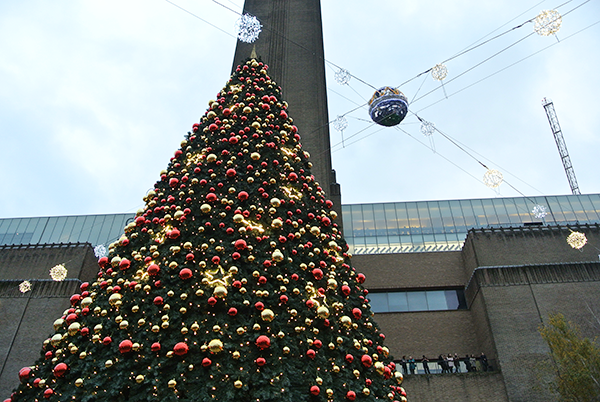 I thought that the Christmas Market at the Tate Modern was a step up from the London Bridge City Christmas Market in that there was more variety in the stalls, including lots of fun and different gift ideas (such as beautiful 3D pop-up cards and brass compasses). There was also a stall with hot caramelised nuts (£3-£3.50 for 100gr), which is always a plus in my book (I especially love the almonds variety). Not only that, but the strings of lights between all the stalls were absolutely beautiful and really got me in the Christmas spirit (in early December!). 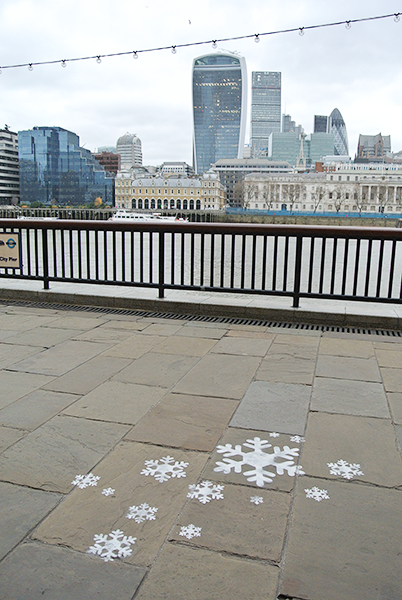 From the Tate Modern it's about a 10 minute walk to the South Bank Winter Market (until 24 December 2015), which nowadays starts a little further than the National Theatre, at the foot of Embankment Bridge (officially called Golden Jubilee Bridges). 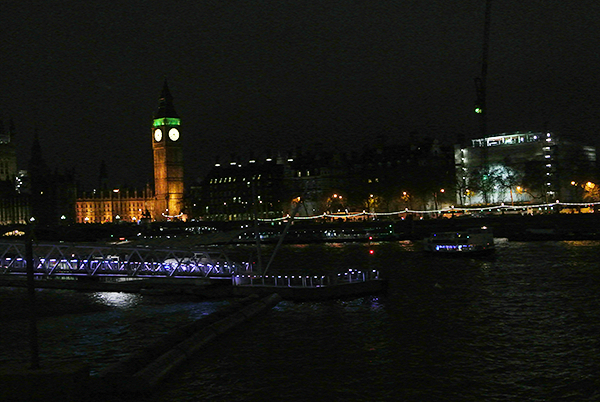 Along the way you have the opportunity to really admire the city as seen from the South Bank, as well as a beautiful row of lit up trees, so it's a pleasant walk. 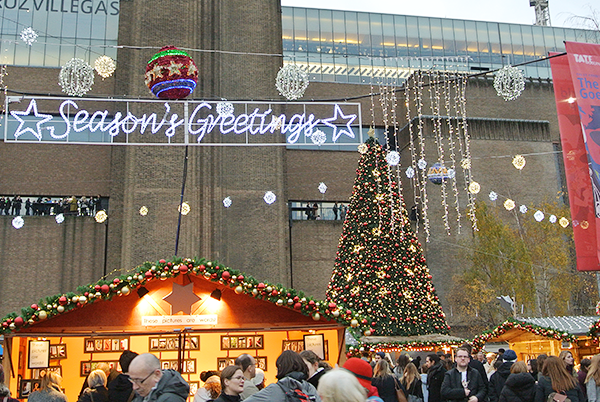 The South Bank Christmas Market is the one that has been on there for many years now, so most people will be familiar with it. 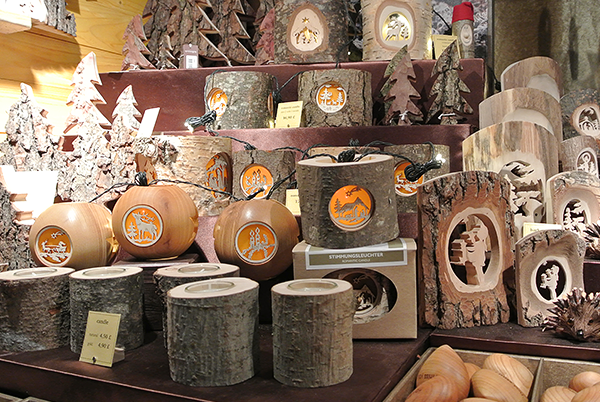 The last few years there has been more of a focus on food stalls rather than arts and crafts, but there are still plenty of unique gifts to be found as well. And it really is a prime spot for some touristy snapshots as well, including great views of the London Eye and the parliament buildings (the Big Ben). The nearest tube and train stations to get home from here are Waterloo/Waterloo East and Embankment and if you need to hide inside from the weather, or you need a toilet break, you can do this in either the National Theatre or BFI, both of which are free to enter (and have some great shows/screenings, so worth checking out in their own right! I especially recommend Jane Eyre at the National Theatre, which is running until 10 January 2016). 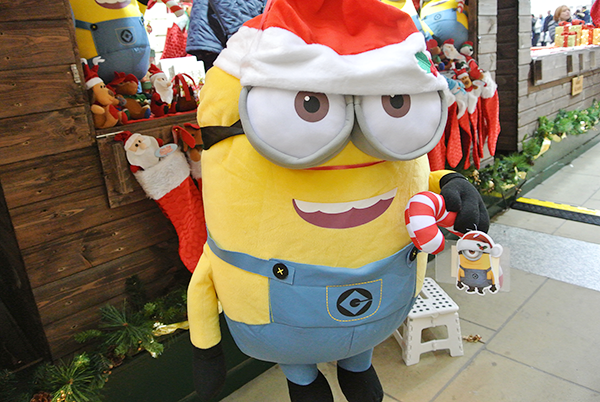 And that was the best of the festive fun on London's South Bank! 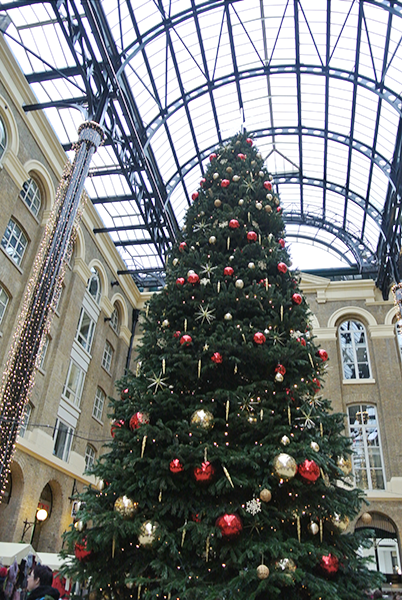 What are your favourite Christmas spots in the capital?